There is a strong possibility the Perfect Weather – NOAA Radar and Forecast iPhone, iPod Touch, and iPad app will become your favorite weather iOS app. Smart gesture controls allow you to customize the interface to see well-organized, thorough details about weather in your current location, as well as favorite locations. The excellent graphics and simple navigation further amplify a great weather iPhone app that is certainly worth every $2.99 for the download from the iTunes App Store. 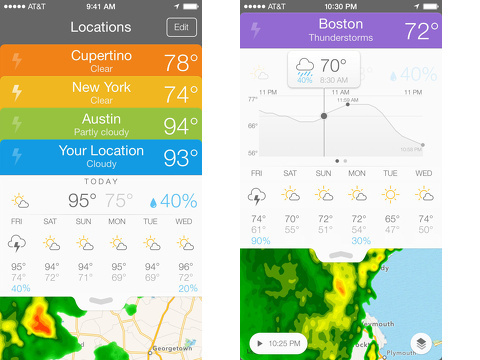 The Perfect Weather iPhone app opens with a simple one-touch authorization to access your location. The default locations are Cupertino, Austin, and your location. You tap the edit icon in the upper right hand corner to make adjustments. An x icon pops up next to each location, and a plus icon appears at the top of the screen. A tap the X icon deletes a saved location, and a tap on the plus icon adds one. The home screen graphics look like file folders with colored tabs for each location. You touch the preferred location’s tab and drag it to the top of the screen for the full view of that location’s information. The colored tab has location name, general condition like cloudy, sunny, etc., and current temp. In the next row, you have more explicit details regarding today’s weather – prevailing condition, high temp, low temp, likely percentage of precipitation. In the next section, the week’s forecast is presented in a simple grid. For each day of the week listed horizontally, the condition, high, low, and likely precipitation are listed vertically under the day. The radar takes up the lower portion of the screen. Any weather alerts for your saved locations can be accessed quickly. The quantity of information and the added bonus of a nicely functioning radar speaks to thoughtful organization and efficiency in design. The tab with an arrow just below the grid of information gives you the chance to customize the screen. You can drag the arrow down to unfold an additional horizontal table of information. There are two sections that can be accessed with horizontal swipes. The first view shows a daily temperature trend graph, so you can see when temperatures are peaking and dropping. The next screen is a list of the following eight additional measures: feels like, humidity, pressure, visibility, wind, sunrise, sunset, and dew point. You can drag the grid of information up to show the radar. You can eliminate one, some, or all sections of the weather details, so the radar can fill as much of the screen as you prefer. The radar can be customized with gestures and layers. You can pinch and expand your fingers to zoom in and out. You can touch the play icon to watch the previous 20 minutes of the radar unfold. The layer icon in the lower right hand corner accommodates a change between cloud and rain radar. You can also adjust the intensity of color of the rain and clouds with a volume style bar adjustment. 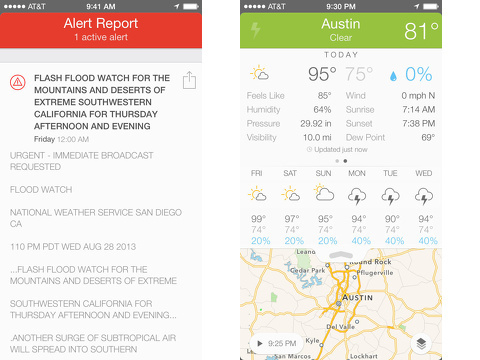 The Perfect Weather – NOAA Radar and Forecast iPhone, iPod Touch, and iPad app is a highly-functional and reasonably-priced choice to become your go-to weather iOS app. AppSafari review of Perfect Weather – NOAA Radar and Forecast was written by Jenni Ward on October 28th, 2013 and categorized under App Store, Productivity, Reference, Utilities, Weather. Page viewed 4686 times, 1 so far today. Need help on using these apps? Please read the Help Page. What an incredibly detailed weather app. I wasnt sure if anything could top yahoo’s weather app but this looks to be the only close contender ive seen to date. Although that said, I love Effing Weather, which adds a much needed comical and often rude spin to this common app category.